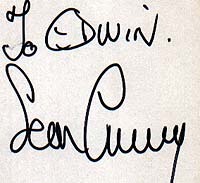 About 80-90% of all Sean Connery autographs on the market are fakes or secretarials. Today's Sean Connery is impossible to get trough the mail and even in-person a tough signer. Most trough the mail autographs earlier in his career are scretarials or signed by his brother. The price for his AUTHENTIC autographs goes up in value all the time. Meanwhile a signed 8x10 shot is at 250-350 US$ and a signed card is at about 180-250 US$. It doesn't matter if you get him on a card or a photo, both is the same hard job! Toughest signer of all five 007's. One of the most seen Sean Connery fakes in the last time. The signature looks always identical to this! Often seen on online-auctions! Beware!